Sweet Cheeks Adventures: Achieving the Trifecta of Perfect with Groupon Coupons! Achieving the Trifecta of Perfect with Groupon Coupons! A special Thank You to Groupon for sponsoring our discussion today. While this is a sponsored post, all opinions are my own. As a Mom, I am always turning to Groupon for fun and exciting things happening in my area. I've been using Groupon since.... well, it seems like 30 years. What is even better now, Groupon Coupons can help you save at stores! I'm going to let you in on a little secret. I'm addicted to coffee, books, and savings money. When I'm able to experience all three of these favorites in an afternoon, I am one happy Momma! To experience this Trifecta of Perfect, I have been turning to Groupon Coupons. 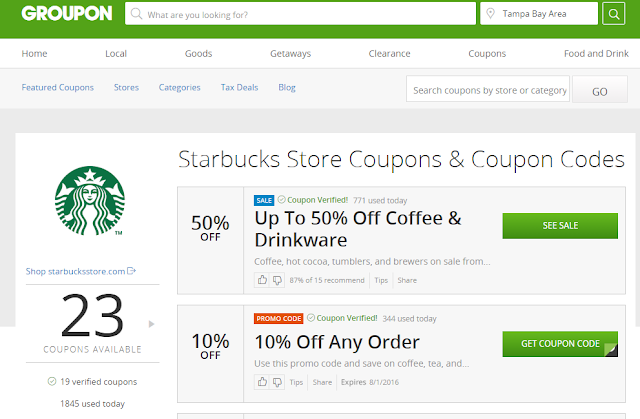 Searching for your favorite stores on Groupon is very simple. This is how I find what is waiting for me from Starbucks. Use the search tool or if you have a little time on your hands, browse around and see what is out there. When I'm in a hurry to get that caffeine in my veins, I use the search bar. From there, I search where I can find a great discount on whichever book I may need on my shelf. You can see from my search that I was successful with Barnes and Noble! Receiving 15% off my order is a great discount! I found some great deals today on my search. This sums up my Trifecta of Perfect! Coffee, Books and Savings really do make my day wonderful. Now, just imagine what else you could be doing with Groupon Coupons. There are so many great stores that can be found by just a simple search. Macys and Kohls are two other favorites of mine! Take a look and follow Groupon Coupons on Facebook and Twitter. I love Groupon and love saving money, so this is perfect, thanks for the information. i'm always looking at their site to see what's new! I have never actually used Groupon, must try it sometime. I hear you find great deals. I'm in love with Groupon Coupons. I've been using Groupon for years, and when they came out with the coupons, I knew it was going to be amazing. It is! I love Groupon! It has saved me so much money over the years! I'll have to try Groupon Coupons! I love using Groupon. It is a great way to save money and try new things at the same time. Oh, I love Groupon! I've always found awesome deals, and nothing has ever turned around badly, either! OMG yes! I use Groupon Coupons all the time and save sooo much money! I love using them as much as possible. I'm definitely liking the discounts they have posted. I need to remind myself to check out Groupon more often. I love love love groupon! We use it a lot durning the summer for activities for the kids! Groupon is a great way to save money. I always check them out when i am looking for a great deal. 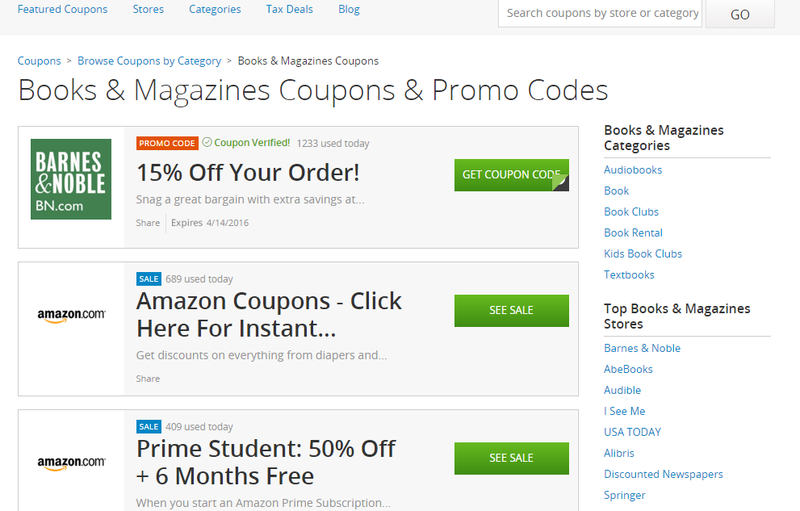 Groupon is amazing and now they have coupons?! Cue the happy dance! We use them for so many different things and now I can't wait to use them for coupons as well. Thanks for the offer here. I have yet to use them for coupons, but I have definitely used them for deal purchases. Thanks for the heads up and now I know. I have not yet used them for savings, but I am going to definitely check them out! I love Groupon so much & have been using their coupons for long as they come up with some great deals that helps in saving money. I think it is good to step in every day to find the best deals you need every day. They have some great deals on Groupon. I haven't taken advantage of one in a long time but I will be keeping a closer look on the offers I get from them via email. I just love groupon!!!! When I lived in Orlando I used them all the time!!! I've heard so many good things about Groupon coupons. Ive used some but I need to use then more.